Two different dealers, located in polar opposite marketing areas of the country, just finished their first Sharp Shooter Program the past couple weekends. Shenandoah, located in Virginia, is used to having perfect riding weather this time of year getting them ready for spring. Vandervest H-D®, located in Green Bay, Wisconsin, never knows what the weather will bring in late March. Unfortunately, for both dealerships, they both got a snowstorm! buying base 52-104 times per year. 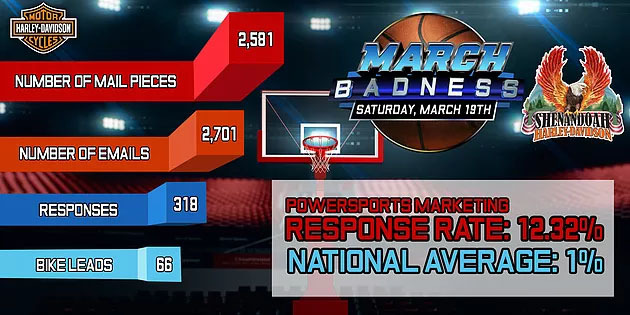 The Sharp Shooter program helps our clients achieve this critical number much faster, by utilizing up to 12 touches per campaign including direct mail, emails, call blast, social media updates, event signage, fliers, web banner, lead magnet, survey site and even more. Having said that, there’s something even more powerful that helps make our clients events weather proof: The Survey Site. Every piece of communication is driving customers to a survey site, to capture First Name, Last Name, Email Address and Phone Number for future marketing. The more contact information you have on each individual customer or prospect, means the faster you’re going to be able to convert them into a sale. That means that the results on the day of the event are actually just a happy by product. The Wednesday before the event is when we send over the Campaign Update, which includes a list of leads generated by the program so far. For both dealerships, Vandervest and Shenandoah, they had snow in the forecast. Erik Vandervest said, “The phones are ringing off the hook (because of the call blast), we’ve already set 5 sales appointments from the leads and everything’s working great…but we’re supposed to get a foot of snow tonight through 11 p.m. the following night (Thursday).” A foot of snow at the end of March is just plain bad luck. However, if Vandervest H-D had spent the money through any other type of marketing, they would have missed out on over 750 sales opportunities generated up to that point and over 150 new & used unit sales opportunities. 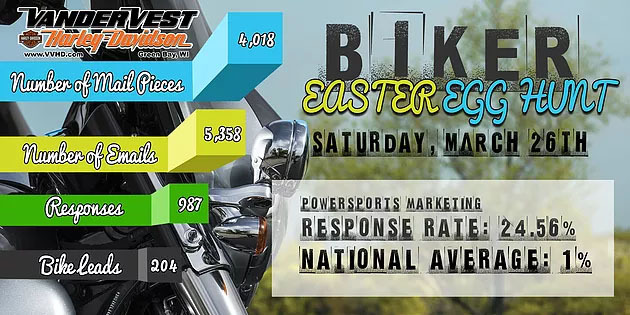 Vandervest H-D: There were 987 surveys completed, which created a total of 803 sales opportunities in P&A, Service, and riding gear, PLUS 204 responses for a new or used bike. The same was true for Shenandoah H-D. 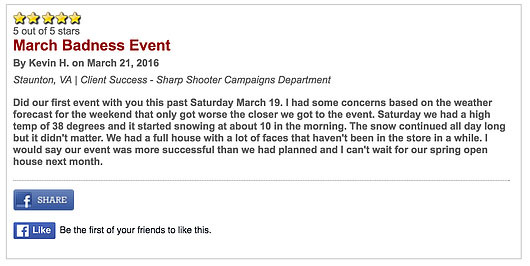 They too had snow in the forecast and it was supposed to be a balmy 30-something degrees on Saturday for their event. Shenandoah ended up with 66 New & Used Bike Leads, 109 Parts & Accessories and 37 Service Leads and 92 MotorClothes Leads! On the day of the event, they rolled 3 units, $11,000 in P&A and $6,000 in MotorClothes with over an inch of snow on the ground. Since then, they’ve, rolled four more bikes! What’s next? May and June mean Summer Kickoff Parties. This is what you’ve been waiting for. If you don’t already have a Kickoff to Summer Open House on the books, plan one today. Check out the insert for an example of a proven winner for May or June. 877-242-4472 ext: 112 or visit us at www.PowersportsMarketing.com and click ‘Sample Campaigns’. Happy selling.